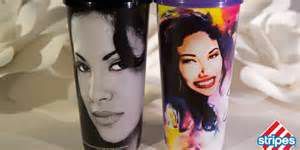 Beginning Saturday April 7, Stripes stores will release two new “limited-edition” Selena Commemorative Collectible Cups. The cups will be sold at Stripes stores in the state and Louisiana starting at 9 a.m. According to a Stripes news release, customers and Selena fans may begin to line up at Stripes stores to buy their cups at 8 a.m., prior to the 9 a.m. release time. There will be a limit of four cups per customer and are priced at $2.99 each. They will be available while supplies last. Officials said like last year, portions of the cup sales will benefit the Selena Foundation. Stripes has been working with Selena’s sister, Suzette Quintanilla, to create the two new designs that feature the Tejano superstar. “I am excited to work with Stripes again on these beautiful commemorative cups of my sister featuring Selena’s image,” Quintanilla said. The Tejano superstar was shot and killed in March 1995 by her friend and former manager of her Selena Etc. boutiques (and salons).